The Filipino Christian Fellowship was celebrated the 3rd year anniversary last August 30, 2009. Same as usual the event was started with the regular Sunday worship service to be lead by Pastor Helen Rojas. After the service, we headed to the church gymnasium for our dinner. Then the games will be the next event. Since we used the gym for dinner, there is no basketball game anymore, only table tennis for teens and volleyball for adults. While watching the games, my friend told me that she plan to buy ping pong table for his son. I told her that there are many ping pong tables that she can buy online. Aside from ping pong tables, they offer the following like pool tables, foosball tables and air hockey tables. 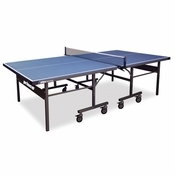 You can also buy accessories such as table tennis balls, table tennis rackets and paddles, nets and many more. Most of the members especially men enjoyed the game while others enjoyed watching and cheering as they were seated on the benches. We left the church overwhelmed with joy and arrived at home at 9 in the evening. Great pictures. That looks like fun.